David O. Harrison, age 44, of Holland Patent, passed away unexpectedly on September 8, 2018 at Faxton-St. Luke’s Healthcare. David was born in New Hartford on January 19, 1974 to Leroy and Mary Morrison Harrison. He graduated from Westmoreland High School and MVCC. On May 25, 1996, he was united in marriage to Tracy Nolan at St. Thomas’ Church, New Hartford. David currently worked as a Correctional Officer at Marcy Correctional Facility. David was very artistic and his drawings were cartooned themed, mainly drawing caricatures. He also enjoyed racing at the CRC Raceway. His loved ones will always remember him as the most kind-hearted, modest, and goofiest man. He was very passionate about supporting his wife and daughters in everything they did. David is survived by his wife, Tracy; two daughters, Shannon and Kathryn Harrison both of Holland Patent; his parents, Leroy and Mary Harrison; a brother, Michael Harrison and his significant other, Michelle Mizgala of Holland Patent; his mother and father in law, Steven and Kathryn Nolan; and his beloved pets Charlie and Fuzzy. Funeral services will be held on Thursday at 6 PM at the Barry Funeral Home, 807 W. Chestnut Street. Burial will be at the convenience of the family. Relatives and friends may call at the funeral home on Thursday from 3 to 6 PM prior to the funeral. In lieu of flowers, donations may be made to the Stevens-Swan Humane Society. 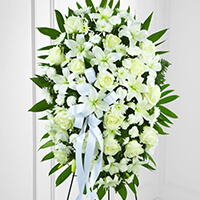 To send flowers to the family of David O. Harrison, please visit our Heartfelt Sympathies Store. With all our love and deepest sympathy to you and your family. Rest with the angels brother, we have the watch from here. Eric and I are deeply saddened to learn of the passing of David. I know he was such a special member of the Stockbridge and Harrison families and heard many stories about him from my dad. My heart goes out to Barney, Mary and Linda. Please know that I am praying for you all.